Donald canard. . Wallpaper and background images in the Donald canard club tagged: donald duck disney cartoon character. This Donald canard photo contains anime, bande dessinée, manga, and dessin animé. 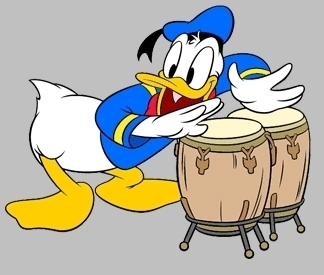 He really knows how to bang those bongos! Hey we find the great musician for our Party ! Great idea! This party is going to be awesome!